Utah's Grand Staircase-Esclante National Monument is filled with hidden treasures. Much of the Grand Staircase requires long hikes into remote canyons. 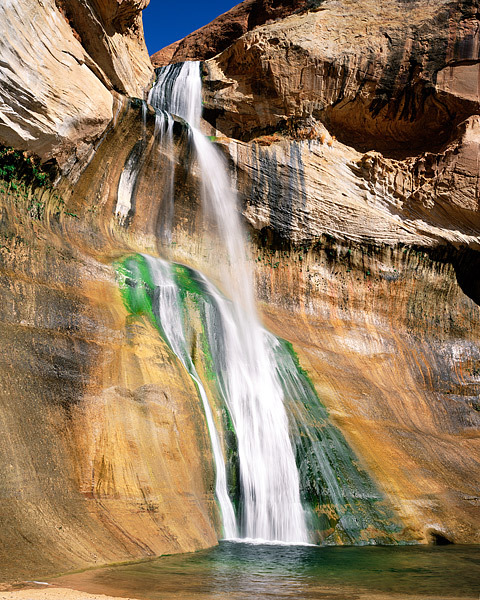 While Lower Calf Creek requires a two mile hike to view, it has become a popular Utah icon. Lower Calf Creek falls located outside of Escalante, Utah plunges 126 ft from top to bottom into a beautiful emerald pool. It's an impressive sight to view and photograph in the arid southern Utah environ. Photo © copyright by Thomas Mangan.